The Daiquiri is a foundation for a huge number of cocktails, referred to at times as the Caribbean Trinity of rum, lime and sugar, originally named after a beach east of Santiago, Cuba just before the Spanish-American War. Although lime, sugar and rum have been mixed long before throughout the Caribbean, the specific proportions in the recipe came together at this time. It is one of my favorites, relying on the quality of the rum, and freshly squeezed limes. Sweet frozen daiquiri drinkers may not realize how their favorite drink does not need to come out of a bottle of swill (AKA mix). If you are reading this and normally buy a bottle of mix for any flavored daiquiri, please understand – nothing in that bottle is pure, and likely isn’t even real – that is to say no fruit – no lime juice, and sweeter than a fistful of candy bars. There is a reason for frozen drinks, why creating ice so densely fine is a tool for consuming alcohol – chilling liquid, adding air and texture, possibly opening up flavors, watering down the power of alcohol, as well as slowing the consumption of a powerful drink. For example, if Zombies, and all the rum therein, were instead strained over ice, I would face-plant into oblivion in record speed, maybe not after one, or two, but far quicker than I would hope. After all, no more than two Zombies were served to a customer in a Don the Beachcombers, where the drink was invented. Crushed ice, or shaved ice is used to slow the transition, and thereby enjoying the drink longer. With that said, I have not been a fan of frozen daiquiris for the reason of peculiarly sweet packets or bottled mixers. Fruity daiquiris have been mutilated with too much sugar, too many other ingredients, many times too much ice, the wrong rums, or worst of all – not enough rum. I wanted to bring out the best flavors, and avoid the useless ones, excluding too much slush to sap the flavor out of the experience, not merely using any light rum, but mixing more than one kind for complexity. Another main goal, and the reason for this post, I wanted to find the balance between drink and ice. If strawberries are not in season, use frozen, but use no more than 3/4 the amount – still using fresh to breathe life into the flavor. I tried purely frozen strawberries, and thought they were sweet, but felt they needed the freshness of even a tart, out of season strawberry. The genuine thrill of freshness never fails the taste buds, even sparingly offered. The only banana I insist using is the level of ripeness reserved for cooking, such as banana bread, or banana cream pie. Brown dots? Not ripe enough. Brown blotches? Getting close. If the banana is mostly brown, that is good enough. If you can, wait until the banana has turned completely brown. I’m talking about how much flavor this fruit will bring, the riper the banana – the more the banana will sweeten. If you think they look disgusting, imagine how sweet they will taste in a drink. If I’m going to eat a banana, I like a few freckles because I like flavor over texture. For garnishing, I prefer a green-stemmed banana (I waited too long for my garnish banana…sticking a clove over a brown spot). Since the Daiquiri is a Cuban drink, I wanted to use Cuban-styled rums. I have not been able to purchase any Havana Club unfortunately, whose family stayed in Cuba, the brand I would choose if the embargo were not in place. Some good rums got out though: The family who created Bacardi escaped Castro, as did the family of the Matusalem brand of rum (Matusalem distills in the Dominican Republic, and Bacardi in Puerto Rico). The venerable Beachbum suggests Plantation 3 Stars rum, which tastes delightful. In the banana drink, I included Coruba dark rum, which is not Cuban, but Jamaican, for its sweet dark brown sugar flavor in the banana daiquiri, rather than a molasses flavor of other dark rums, and felt it blended remarkably well with the sweetness of Matusalem. In a blender combine rum, strawberries, lime juice, syrup, cream and ice and blend until strawberry is thoroughly combined. 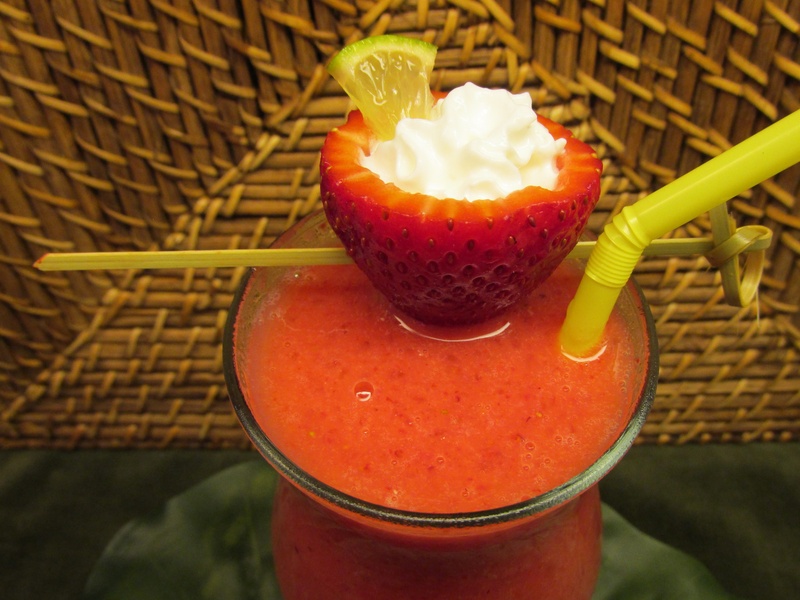 Garnish: Clean and hull a strawberry, fill with whipped cream, garnish your garnish with a tiny triangle of lime. Serves two. Blend all ingredients except ice in blender until smooth, creamy and firm. Stir in shaved ice until preferred texture. Garnish with dolphin banana with rinsed and dried cherry in its mouth, inserting a positioned clove for an eye. If you feel the need for fins, slit a spot for a trimmed lemon peel, or pineapple leaf, or even shaping your fin from an Anna’s cookie. It’s all for fun anyway, right? Serves 4…only once, and then you’ll have to make another pitcher. 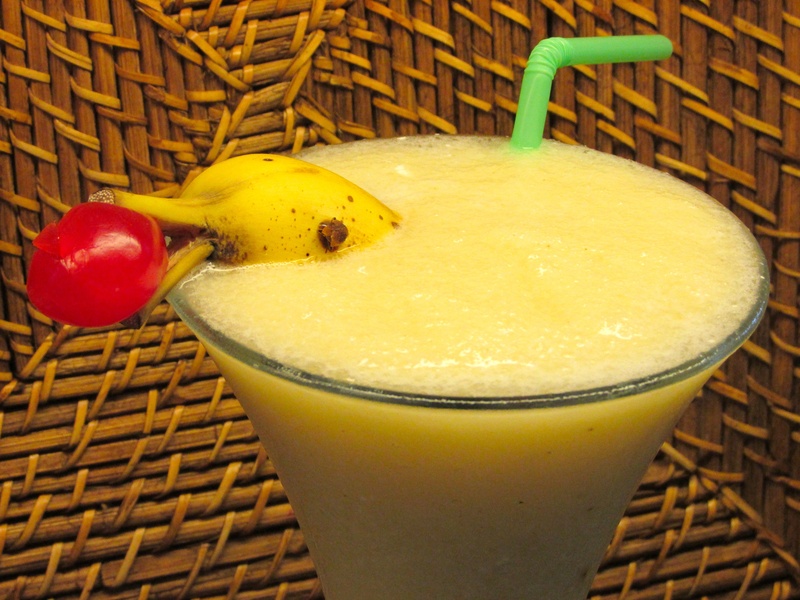 If you prefer to make banana daiquiris for two, here is the recipe for nearly half the amount, not strictly cutting the ingredient amounts in half. Note: Do you not own a blender, or are between blenders because your old one died? An ice shaver works perfectly well, not to say it replaces a blender, but focusses on just the ice to scoop in after the ingredients have been pureed in a food processor, or muddled (both of which I have tried).